Paula Shoyer is a serious baker. So many cookbooks—lovely, inspiring, must-own collections—are authored by self-taught home chefs who have turned cooking into a passion. But Shoyer is the real deal, a French-trained pastry chef who is as comfortable with choux pastry, mille-feuilles and pithivier cakes as we are not. Yet the brand new Holiday Kosher Baker: Traditional & Contemporary Holiday Desserts , her sophomore effort after the tremendous success of The Kosher Baker, blends like a rich and homey dessert the elegant touches we aspire to in our holiday baking with the comfort and ease we, as home cooks, need. 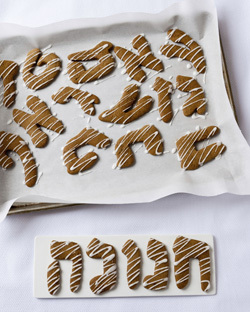 Shoyer arranges the recipe collection by the Jewish holiday calendar. Her Hanukka chapter is stuffed full of “Easy Chanukah Desserts” (Almond and Olive Oil Cake, Gingerbread Cookies, Apple Latkes) and, for the intrepid in the kitchen, “Fancier Chanukah Desserts” (Chocolate Ganache Glazed Doughnuts, Whole-Wheat Jelly Doughnuts, Churros with Melted Chocolate). Particularly helpful, in the Hanukka chapter and throughout the book, are Shoyer’s tips, clearly the learned experience of a professional. She features an entire page dedicated to “Doughnut Making Success,” with suggestions such as the best oil for frying and how many balls—whether small or large—you can reasonably fry at one time. And, perhaps most cleverly, Shoyer includes a recipe for Olive Oil Challah and Challah Doughnuts, which produces enough dough to make two halla loaves for Shabbat plus a batch of doughnuts. Sweet genius indeed! Still hungry? Just wait till the calendar stretches to Purim: Beyond typical hamantaschen, Shoyer gives us the latest in culinary trends, namely versions that are gluten-free, made with green tea, are low sugar and one that is a red velvet cookie. Her Passover section—perhaps the holiday most fraught for the Jewish baker—features 45 recipes, from biscotti and macarons to cupcakes, black and white cookies, key lime pie and crepes. Getting back to the holiday at hand, this year I’m going south of the border in my frying endeavors, sharing Shoyer’s delicious Churro recipe. And in a whimsical theft of the seemingly ubiquitous holiday others will soon be celebrating, Shoyer’s Gingerbread Cookies recipe is hard to pass up—plus, once you add cookie cutters to the mix baking becomes a welcome project to share with kids and grandkids. Makes 35. 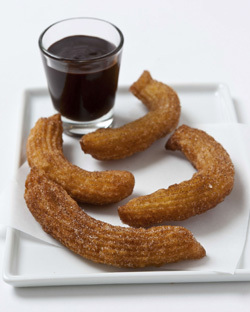 Churros are long, thin-ridged Spanish doughnuts made out of choux pastry, the dough used for éclairs and profiteroles. In Cuba and Brazil, churros are filled, just as we fill sufganiyot. Here they are rolled in cinnamon sugar, the way they are eaten as street food in many Latin American countries. Preparing the dough: Place the water, oil, sugar, vanilla and salt into a small saucepan and stir over medium heat to dissolve the sugar. Bring to a rolling boil. Reduce heat to low and add the flour. Use a wooden spoon to mix the dough over the heat until the flour is completely mixed in and the dough comes together into a ball, about 30 seconds. Remove this mixture from the heat and scoop it into a medium bowl. Spread the dough around the bowl and press the dough up the sides of the bowl and let sit for about two minutes to help it cool down. Add the eggs one at a time, mixing well after each addition. You will need to mix vigorously to incorporate the eggs. Press the dough into the sides of the bowl with the spoon to mash the eggs into the dough. The dough will clump up, but after more stirring it will come together. Put the dough in a pastry bag fitted with a large star tip or a round tip with points, with about a 1/3-inch opening; I use Ateco #864. In a shallow bowl, combine the sugar and cinnamon. Set aside. Heat 1 1/2 inches of oil in a medium saucepan over medium-high heat until the temperature holds at 375°F. Place a wire rack over an aluminum foil-covered baking sheet. Hold the pastry bag an inch or two over the hot oil by reaching a little into the saucepan. With the pastry bag in one hand and a knife or kitchen scissors in the other, quickly squeeze out a 3- to 4-inch-long strip of dough and then use the knife or scissors to cut it off and let the dough drop into the hot oil. Repeat five more times. Cook no more than six strips of dough at a time. After one minute, separate any churros that are stuck together. Fry for a total of four to five minutes, turning them over after about two minutes, until they’re golden. Use a slotted spoon to lift the churros onto the rack to cool slightly for a minute, or until you can handle them. Roll the churros in the cinnamon sugar and serve. Do not wait until the churros are completely cool before rolling them in the sugar; the residual oil helps the cinnamon sugar stick. These are best eaten the day they are made. Serve with melted chocolate. Store covered at room temperature for up to two days or freeze for up to three months. Reheat to serve. Makes 30 3-inch cookies. I thought this recipe would be easy to develop, but after two different friends tested the recipe and both pronounced it not spicy enough, I worked hard to create a full-flavored gingerbread cookie. To make the dough: Place the margarine and brown sugar into a large bowl. Beat with an electric mixer or by hand with a wooden spoon until creamy. Add the egg, molasses and vanilla and beat until mixed in. Add two cups of the flour, baking soda, salt, cinnamon, ginger, nutmeg, cloves, and allspice and mix with a spatula or wooden spoon; if you are using an electric mixer, mix carefully so the flour does not dust your face. Add the last cup of flour and mix until combined. The dough will be gooey. Place two large pieces of plastic wrap on your counter. Scoop up and place half of the dough on one piece of plastic and the remaining half on the other. For each half of the dough, fold the plastic over the dough and then flatten it into a pancake, about 1/2- to 1-inch thick. Freeze overnight. five minutes; you want to roll it out while it is just barely soft enough to roll. You will need to bake in batches. Take two pieces of parchment and sprinkle a little flour on one, place dough on top and then dust with a little more flour. Place the second piece of parchment on top of the dough and roll on top of the parchment to roll out the dough until it is a little thicker than 1/4-inch thick; do not roll too thin. Every few rolls, peel back the top parchment and sprinkle a little more flour on the dough from about 10 inches high, so you do not get big white spots on the dough. Remove the top parchment and use it to line a cookie sheet. Line another cookie sheet with fresh parchment. Use cookie cutters to cut out cookies and then use a metal flat-blade spatula to lift the cookies and place them on the prepared cookie sheets. Use a pastry brush on the cookies to dust off any excess flour. Reroll any scraps and cut more cookies, adding a little flour each time, taking care not to roll the scraps too thin. If the dough becomes too soft and gets stuck to the bottom parchment, put it in the freezer until it hardens slightly. Repeat with the second disc of dough. Bake for 9 to 11 minutes, or until the cookies are set. When they are done, you should be able to press into them slightly. Slide the parchment off the cookie sheet onto a wire rack and let the cookies cool for one minute and then use a spatula to lift the cookies onto the rack.